I love that zucchini can be cut into noodly strips and called “raw pasta.” But I also love that you can make a raw zucchini salad! Despite what a lifetime of overcooked zucchini might have you believe, zuke actually has flavor. It’s delicate, yes, but fresh and verdant. When eaten raw, it’s delightfully crunchy, and perfect for a light lunch or alongside a sandwich or veggie burger. I dressed it really simply, but don’t be deceived, it still has flavor to spare. There’s lots of garlic; like, enough to ward of kisses for at least several days. A touch of olive oil and some fresh tomato dress it beautifully. 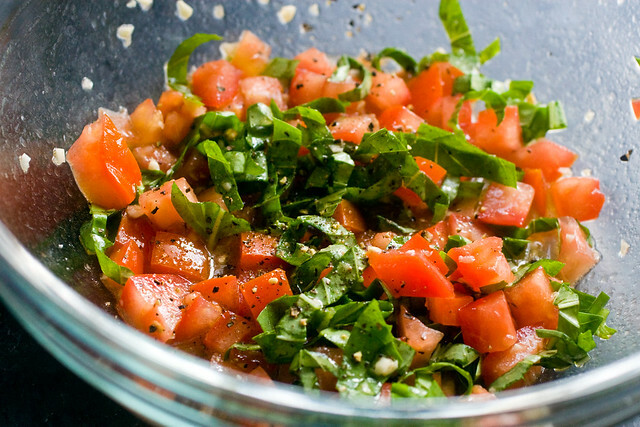 And basil makes everything pop like a springtime garden in your mouth. Sometimes it’s the simple things. Enjoy! ~ If you’re looking for a more substantial salad, you can bulk it up. Add chickpeas, toasted walnuts, and avocado. Yum! ~ Don’t worry about getting the zucchini into perfect ribbons. Simply give the zuke a preliminary peel so that you don’t have too much skin (unless you like that.) 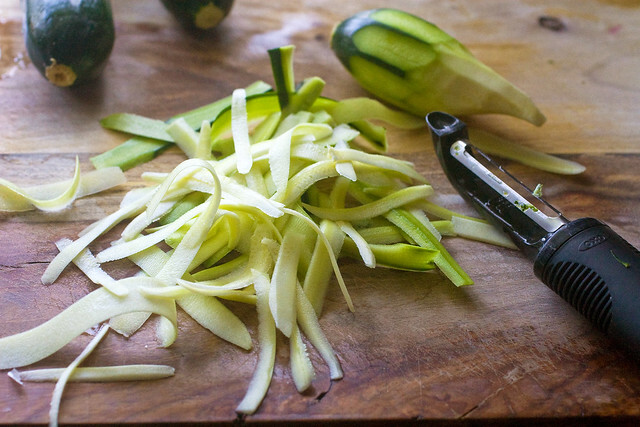 Then place on a cutting board and peel into rustic ribbons, turning the zuke as you go. You might have a little nub left over, so just slice it up and add to the salad. Really, you can’t go wrong. Anyway you slice it (har har) it’s going to be great. ~ Use a non-serrated peeler if you can, or your ribbons will have ridges. Not the biggest deal, but probably worth mentioning. ~ You want to serve this as soon as possible, to retain its crunch and freshness. If you let it sit for awhile, it will become more like a slaw. So lovely and fresh! This will make a gorgeous light supper when the temperatures get really high! I really enjoy the simplicity. Thanks for sharing. Beautiful! I love raw zuke! This looks so refreshing! Since I’m out of basil at the moment (used it all up on making Bestest Pesto!) I’m going to see what using the pesto as the dressing will be like. yum. i love raw zucchini in pasta salad too. Love, love, love! this idea. As always…brilliant. Can’t wait to give it a try. Fresh, raw zucchini is the best 🙂 I may have to hunt some down after seeing this post. Thanks for sharing! This recipe looks lovely! However, I would like to try to reduce the amount of olive oil- would that compromise the overall taste? I love how the olive oil tastes, but if you’re used to eating low/no-oil then I’m sure you will like it without. I made this for lunch but used parsley instead of basil (didn’t have) and added avocado as you suggested. It was great!! It’s so fun to eat zucchini this way! Thanks for the recipe. Innovative as always. What a great way to serve zucchini, thanks for this easy to make and delicious recipe. So good looking. Also I want to say thanks for introducing baketivism to me and the rest of the world. Promoting veganism in a positive light, to me,is the most effective way. You got it figured out I think. Go you. I’ve always been afraid of eating zucchini raw but this salad may just be what I needed to be convinced otherwise. Love the dressing! Light and flavorful. I couldn’t stop eating it. Love this! So simple, clean and beautiful– and fun for kids to help! do you think this would work with yellow squash instead? Finally got around to making this tonight. It was super yummy and so easy to make! It took all of 10 minutes or so. I didn’t have any fresh tomatoes, so I used half a can of fire roasted tomatoes. Ive never had raw zuke before, but after eating it this evening, i would say this is the BEST way to enjoy it! The end result was superb and I can’t wait to make it again! Thanks again! 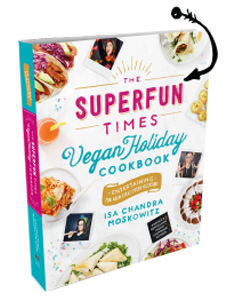 I have yet to try a recipe from ppk/veganomicon that I haven’t loved. Made this salad today..shared it with everyone on fb. Love it. Thank you! This recipe isn’t getting much love because…salad. But it is so simple and yummy. You have gone and done it again. You can take anything and make it delicious. I took your suggestion of adding avocado to it but it was so flavorful either way. Thank you for another keeper! Oh my, so delicious! And simple! Never would have thought to try zucchini raw. Thank you! This going straight to the top of the hot weather menu list. This may not be getting much love here, but I’ve made it 4 times in the past 10 days, so it’s getting plenty of love in my household!!! Wonderful! Personally, I preferred the squash chopped instead of the ribbons, but the flavor is fantastic either way. So great on a hot night…and easy. I took a few tops of our adolescent basil plants (not a bad thing to do to make them bushier rather than bolting in the heat) and I loved how this dish showcased the garden basil taste, first of the summer. Made it last night and it was absolutely delicious! Thank you! As of tonight- My awesome Toronto friends and I have deemed this the salad of the summer. Added an avacado, thinly sliced red bell pepper, a few chili flakes and voila! amazing gastronomic happiness. Thanks Isa – from North of the border. So incredibly delicious! Added avocado for fat since we need it and couldn’t resist adding just a few shards of Walla Walla onion because we love onion with zucchini. Shared this with neighbors since I made so much and everyone raved! Great new recipe for raw zucchini. I may never bake zucchini cake again! Delicious Salad :). I used lemon juice instead of the wine vinegar. I also added in cilantro and chickpeas and it tasted amazing! Thanks for the recipe! I made this today and my hubby and I loved it! Perfect for this hot weather. Made this for my In-laws and they loved it! So fresh and so yummy! I used white wine vinegar (didn’t have red) and it was great! Thank you! This looks so wonderful! Can’t wait to try. Thanks for sharing. 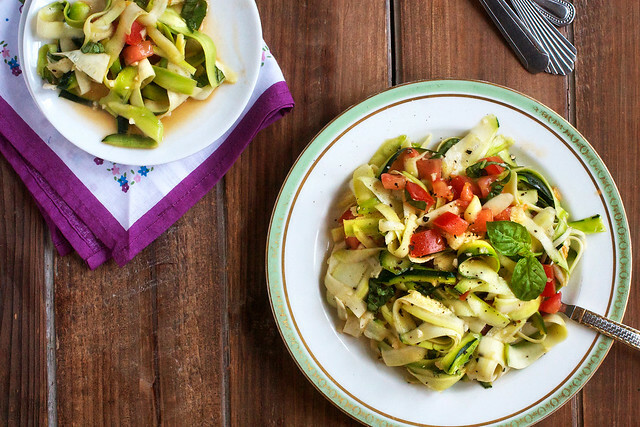 Tomato-Basil Zucchini Noodle Salad | the taste space - steam, bake, boil, shake! This was really, really simple, and really, really delicious. Very good. Not vegan so I put cold grilled salmon on the salad. Used the mandolin to julienne the zucchini. This is the best salad. I made it with the chickpeas and avocados and it was amazing. This is what I am going to take to the next potluck I go to. Wonderful! I had one of those rather large homegrown zucchini and used it to make the salad for a ladies luncheon. Everyone loved it! I just doubled the amounts. Wild have been fabulous with homegrown tomatoes… Served it along with thinly sliced crusty French bread, great for soaking up the wonderful juices. Reminds me of a cucumber salad that my french mom makes with garlic and vinaigrette. So good! I especially love that this recipe uses ingredients that are growing all at the same time of year. I had a extra huge zucchini and it made these really long fun ribbons! Next time I think I’ll try to marinate red onion slices in the vinegar and then add those to the salad. The inside parts of the zucchini are fantastic braised with onions and tomato! Great zukes, Batman! This is awesome! I didn’t have fresh basil and it still rocked with dried basil! My kids even liked it and they are sworn enemies of zucchini! Thanks! You are the most innovative vegetarian culinary artist and you have converted me wholeheartedly! My body, my psyche, and my family owe much to you. What planet are you from?! Isa – this was so good. I’m guessing it was good for me but who cares? It’s everything summer should be. Shared it with my friends! Thank you! Thank you. I was panicking about what to do with all the zucchini I’ve picked in the garden lately. One happy, fed guest later and three of them have gone. There were some leftovers but I threw them in the blender with a little left over lettuce trimmings and now have begginings of a tasty cold soup for tomorrow’s lunch. so delicious, thank you for sharing!